How do you present your fashionable sunglasses to your customers as a store owner of sunglasses or eyeglasses? Do you just place them anywhere and let your customers try to find their way around or are you just organizing these sunglass or eyewear accorind to their colors, brand and style etc? In nowadays socity which are filled in all kinds of advertisiment,with some sunglass displays or eyeglass rack are not doubtedly good way to show off your items. As one nice acrylic sunglaqss display can high light your sunglasses and attractive your customers'eyes. Thus now acrylic sunglass display or acrylic eyeglass dispalys actually place place an important roles in business advertisiment, it can stand out your products! When you have a acrylic sunglass display, it can help you to present your different style sunglass or eyeglass neatly. If customers cannot touch or try on the glasses that they want, they tend to look for the same sunglasses in other stores. This is why placing your sunglasses in sunglass display stand is a wise choice. You are giving your customers the choice of checking each product. 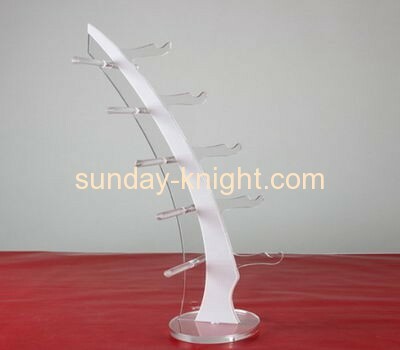 Acrylic sunglass display helps you store look neat and chic. These are important factors since the way your store look will dictate on how many customers it will attract. If your store is a little bit shabby and your products are scattered everywhere in your shop, surely, your customers will be turned off. 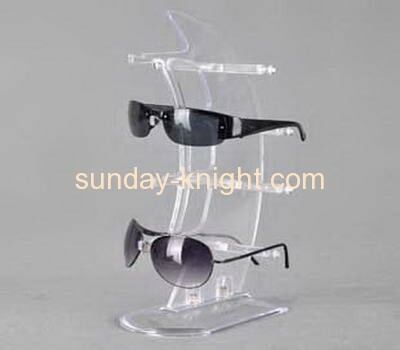 But if your sunglasses are placed in acrylic sunglass display stand, you are given more space and room to display your products. Except this, you can now categorize your products properly. You can place sunglasses with the same color and design in one stand while you can place other colors in other stands. If you think that it is a bit complicated and that you do not have talent in designing suitable acrylicc sunglass displays. You are welcome to provide us your drawing or specification or just your ideas and we can try to recommend some suitable acrylic sunglass displays for your selection and also we can custom design them for you.